Here we are, on the First Sunday in Lent, and we are moving into some difficult lessons. That seems more than appropriate, considering that there really isn’t anything particularly easy about Lent. During Lent, we are challenged to be more aware of spiritual disciplines and practices. We take up various forms of the spiritual practice of fasting. We are challenged to be more open-hearted and open-minded. We are called to an awareness of those in need and how we can be of help to them. We are to live that way all-year-round, but it is more concentrated and intentional in the season of Lent. We begin with the first of the parables assigned to us for Lent – The Parable of the Unforgiving Servant. That means we’ll be focusing on the challenge of forgiveness and reconciliation – and there is nothing easy about that. Forgiveness and reconciliation are complicated issues. It is easy to talk about forgiveness and reconciliation than it is to offer it or receive it. So, if Sir Elton John was right, that “sorry seems to be the hardest word,” then there might be a tie. “You’re forgiven” is pretty hard to say, as well. When we look at that list, we probably think, “makes sense.” Nothing too controversial there. Peter – bless his heart – speaks for many of us. Peter asks Jesus, “How often should I forgive? As many as seven times?” Peter seems to answer his own question: “seven times?” That sounds quite generous, exceptionally magnanimous, downright liberal, if we dare use that word. Jesus takes Peter’s offer of forgiving seven times up a notch. Depending on how you translate the phrase, Jesus tells Peter that he must forgive 49 times, 77 times, or 490 times. Regardless, the lesson seems to be that forgiveness is to be offered without bounds or limits. But there may be something more here. The use of “seventy-seven” times may harken back to a little remembered story in the Old Testament. In Genesis 4, we encounter Lamech, who tells his wives that we will avenge himself “seventy-sevenfold” on anyone who dares attack him. Could it be that Jesus is teaching Peter and the rest of us that forgiveness is the way to travel and not the way of revenge? Forgiveness instead of vengeance. Reconciliation instead of retribution. Jesus is calling those who would be his disciples to a new way of living together. To further teach the lesson of forgiveness, Jesus offers a parable. It’s a kingdom parable and we’ll be hearing more of them in the coming weeks. We also need to remember that it is a parable and not an allegory. We shouldn’t assign identities to the characters in the story. The story begins with a ruler – a sultan – who wanted to settle accounts with those who served him. These are not necessarily slaves as we would think of slaves. They are people who have authority that has been given to them by the ruler. One of the underlings is called before the sultan, who owes the sultan ten thousand talents, roughly the daily wage for one-hundred-million day workers. But, he could not pay. Restitution is impossible. There is no way to make it right. The sultan is ready to inflict the most degrading punishment possible: he will sell the underling and his family into slavery. The underling pleads for time to make restitution – an act so impossible because of the sheer amounts involved. Then, unexpectedly – out of nowhere – the sultan forgives the debt and lets the underling off scot free. The second scene of the parable has the freed underling encountering another who owes him money. Once again, the debt cannot be paid. But this time, the forgiven underling throws his debtor into jail “until he can pay off the debt.” It may not need to be said, but let’s make sure we’re all on the same page. You can’t pay off a debt when you are imprisoned. The final scene of the parable finds other underlings, who are aware of the harshness of the treatment meted out by the forgiven debtor, going to the sultan and reporting all that the forgiven underling has done. When the sultan hears them out, he orders the ungrateful debtor to be tortured until he can pay off the debt. Another impossibility. The key to the whole parable is found in the statement the sultan makes, “Should you not have had mercy on your fellow slave as I had mercy on you?” The center of the story is the magnanimous grace the sultan had on the underling who owed him more than could ever be paid. That is what the Kingdom of Heaven is like. The Kingdom of Heaven is a realm of magnanimous grace, or incomparable compassion, of the fullness of forgiveness. The Kingdom of Heaven is where and when reconciliation is achieved in place of retribution. The Kingdom of Heaven is where and when forgiveness is extended instead of vengeance and reprisal. The story is told of the Sunday School teacher is who was teaching a lesson of the forgiveness of sins. After going on, at some length, the teacher inquired of the students what was needed to be forgiven of sin. One little student piped up, “you have to sin.” Hard to argue with that. But it’s a good place for each of us to begin. As we seek to extend forgiveness to those who have sinned against us, it is good to remember the times we ourselves have sinned against God and neighbor. It is important for us to recall when we were the one standing in need of forgiveness and how it was given to us – beyond what we deserved – in excess of what we would have been able to repay. Even when we forgive but can’t forget, it is important for us to realize that forgiveness and reconciliation are always our goal. just breathed out the previous one. When we fail to extend forgiveness and offer reconciliation to another, we have little room to welcome them into our own lives – from God or from neighbor. Forgiveness offered by those who would be Jesus’ disciples is a reflection of God’s grace into the conflicted and chaotic world in which we live. Forgiveness and reconciliation stand in stark contrast to the vengeful and vindictive practices that we see in play everyday. As we offer forgiveness and work for reconciliation, we bring the Kingdom of Heaven a little closer to reality in the here-and-now. When the horrific practice of apartheid collapsed in South Africa, Archbishop Desmond Tutu was asked to work toward reconciliation and peace. Tutu adopted an African philosophy called ubuntu into a theological framework. At the core of ubuntu is seeing that all people are equal – that all people are created in the image of God. Black, white, brown, native born, immigrant, none of that mattered because all were created in the same image of God. Whenever that image of God was disfigured or diminished, there was a need for forgiveness. But then, Tutu went a step further. Across South Africa, Tutu convened gatherings of the Truth and Reconciliation Commission, where the victims and the practitioners of apartheid met face-to-face and listened to stories of abuse and mistreatment. It was not unusual for people on both sides of the issue to openly weep as the terrible stories were told. In the realization that they had both been harmed and that all were created in God’s own image, authentic forgiveness could be offered and received. Healing took place and continues to take place to this day. Forgiveness and reconciliation are always possible. It very often takes courage and it’s very often takes time. The key is to forswear the pathway of revenge and vindictiveness that is too easily traveled. It will not be too long until we are reading Jesus’ words from the cross: “Father, forgive them, for they do not know what they are doing.” It might not be too much to read into Jesus’ words, “Father, forswear your vengeance upon them. They don’t know what they are doing.” If Jesus is asking God to forgive and to forsake retribution against those who are crucifying him, maybe we need to reconsider the forgiveness we are withholding from another and the vengeance we are seeking against another. The way of life which marks this new life that is ours in Jesus Christ is the way of forgiveness, mercy, and reconciliation. If we are still remembering and counting how many times we have forgiven someone, we probably haven’t forgiven them at all. If we are setting up conditions that are necessary for us to extend our forgiveness, then we have yet to learn the lesson of grace. If we are withholding forgiveness from another, we may be withholding it from ourselves. Jesus taught us in the prayer: “Forgive us our debts and we forgive our debtors.” Put it this way: “forgive us our sins as we forgive those who sin against us.” In order to receive and enjoy our own forgiveness, we must extend that forgiveness to others. 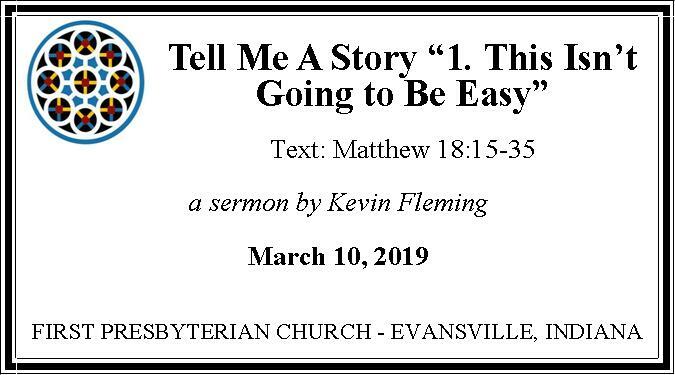 “This isn’t going to be easy.” Little about living the life Jesus pioneered ever is. But it is the way that leads to life – abundant and enjoyable. Life that is for now and evermore. Amen.